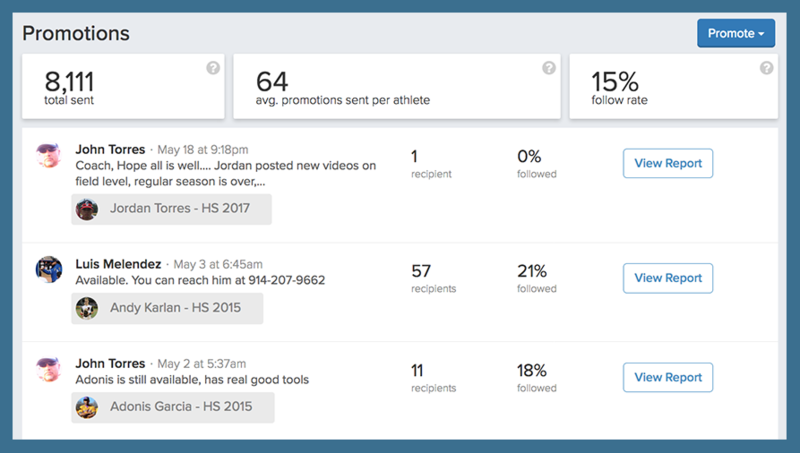 You can recommend your athletes directly to college coaches in your network using Promotions. Promoting your athletes to your connections is a great way to help them get in front of the right college programs for free. For athletes upgraded to FieldLevel Premium, you can promote them to ANY college coach on FieldLevel, not just to coaches in your personal network. Premium athletes receive Recommendations of colleges where they match, helping them target the right schools and providing you the ability to promote them to more college coaches. To learn more about Recommendations, click here: What are College Recommendations? Promoting your athletes is the best way to help them get interest from college coaches. Although coaches can search for recruits on FieldLevel, when they receive promotions from coaches in their network, they are much more likely to engage. You can promote your athletes to multiple college coaches at the same time, but the most effective promotions are personalized. Promotions contain your athlete’s profile along with video, academics, contact info, your certification, and a personal note from you. For instructions on how to promote athletes, click here: How Do I Send a Promotion. When college coaches receive promotions, they can message you back directly.